Winter coats are the main staple winter season after winter season and as any other time, designers and high street stores are trying to outdo each other to satisfy our never-ending need for the latest fashion trends. I must admit, I’m a bit of a coat addict and every winter I get two or three new pieces. I can’t help it, I just want to have a different style for every occasion! I’ve recently splurged on two Warehouse coats during their sale period (it’s still on!). Who can blame a girl and when is the better time to get a new coat then now, when all shops are tempting us with their discounts, just in time for their spring collection to come in! So while I was splurging away, I discovered this gorgeous camel Warehouse faux fur collar coat and also a Warehouse textured raw edge biker coat that I’m sporting in my outfit post: Masculine vibes. And for the girly days and pastel vibes, I treated myself to Miss Selfridge pastel pink coat, please see this girly pastel pink outfit post where I talk about the basic rules on how to style pastel pink and where I wore three Pantone colours of 2016. …But that’s how I like my wardrobe. My days are not the same so why should my style be? 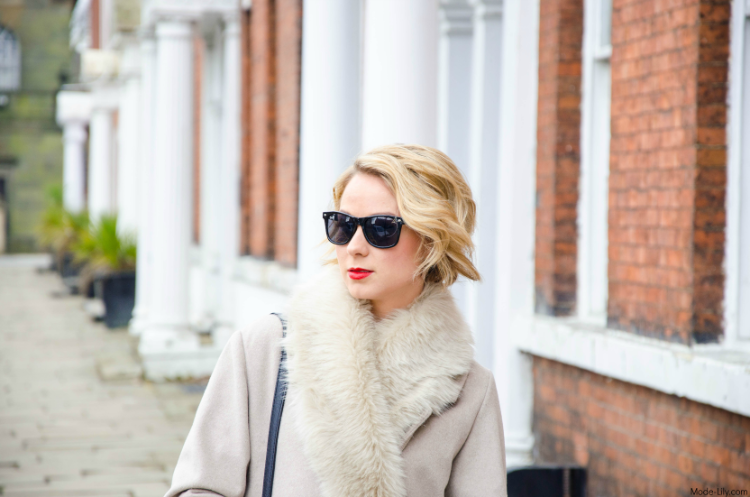 The long chic beauty I’m styling today is perfect for days when I need to wrap up warm and still look good. I guess that’s the power of a good winter outfit, right?! Whilst we are still waiting for the sunshine, sure it’s beginning to become a little more mild. Nevertheless mornings are still pretty cold and this is when this Warehouse coat comes to its use. I’m pretty sure there will be few more weeks before I will have to hide it at the back of my wardrobe for the next winter season. I’ve paired the beige maxi coat with a few of my current favourite pieces, Warehouse lace blouse and a simple black office-style Zara skirt. I opted for the black to add a bit of contract into this outfit. Complimenting the glamour of this coat, I’ve opted for the blitz of a Bonmarche necklace, adding just the right sparkle, though not overpowering the whole look. So there you have it, my latest cosy winter coat obsession to add into my collection – silver lining of the cold days. 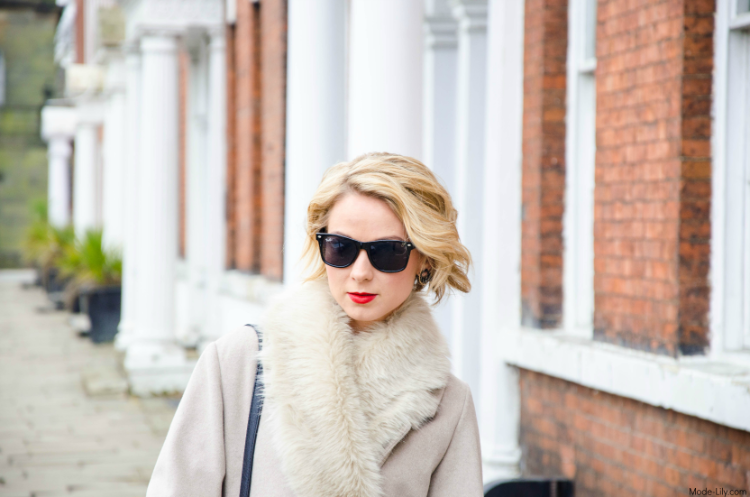 From pastel pinks to statement faux fur, the cold temperature cannot surprise me! I don’t want to freeze in this chilly weather now, do I girls! This coat is gorgeous! I've been loving coats too this winter, it is an item of clothing I didn't pay much attention to in the past but this year I've been tempted to by three or four different coats haha. You look elegant, the total black look is the best 'background' to show off the beautiful greyish beige of the coat! You sassy Sassperilla you! This coat looks so cosy & ever so glamourous too. You look lovely! I’m addicted to buying coats, I need a wardrobe just for them. 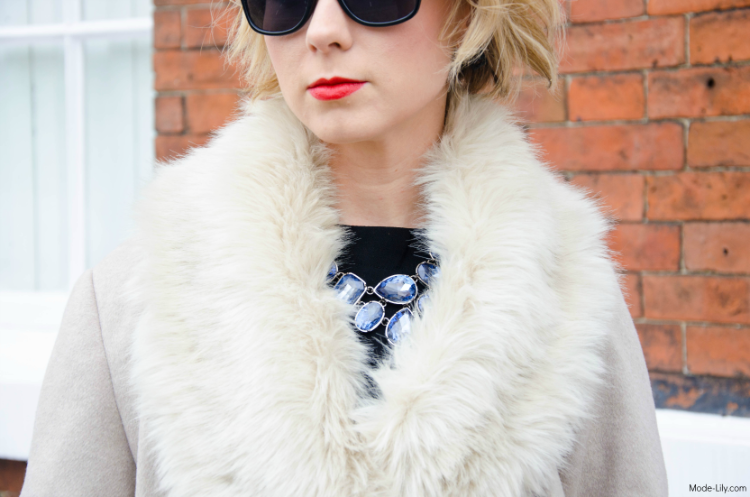 Welcome to Mode Lily...predominantly a fashion blog written by Dash (yes, hello that would me) from Leeds, UK. If you love to read about fashion, beauty, cooking experiments, DIY, travel and photography, you've found the right place! All product selections, opinions, endorsements and styling choices are 100% my own and 100% genuine. Mode-Lily site is also a member of several affiliate networks which means that I may make a commission on clicks and purchases from some links contained on this site and related social media platforms (including Instagram, Twitter, Facebook and Pinterest). All photos, unless otherwise credited, were taken by the owner of this blog and are the owner's sole property. Should you wish to use them, please contact the owner at modelilyuk@gmail.com and link back to this site, providing the appropriate credit. To the best of my ability, every image on this blog that is not the work of the owner has been properly credited and linked back to the original owner. Please email modelilyuk@gmail.com if it appears any image has not been properly credited and it will be fixed immediately.